Last week i completely changed how the bedroom has looked for two years! Our bed used to be covering the air vent and it would be a little hot in the summer and cold in the winter. I sucked it up because i thought it looked the best but when Trent mentioned that our little girl would get cold this winter i was like OH MY GOD WE HAVE TO MOVE THE BED RIGHT THIS SECOND!! We put the bed on the other wall and the room looked SO much bigger and i was excited to decorate the new large corner we had! I knew i wanted one piece of statement art so when Point Two Design offered to send one of their prints i was thrilled! We had just gotten back from Amsterdam (which we FREAKING. LOVED. by the way) so it was a no brainer to get a reminder of our wonderful time there! Point Two Design is different than other city map companies because they are architecturally trained and are able to make prints of any city, town or neighborhood on earth! You can also choose the crop, colors, and words on your print! Christmas is coming up very soon and i cant think of anything better than getting everyone on my list a unique and meaningful piece of art. You could get the old neighborhood in Italy that your grandma is from, or your dad's college town that he always talks about- the options are endless. 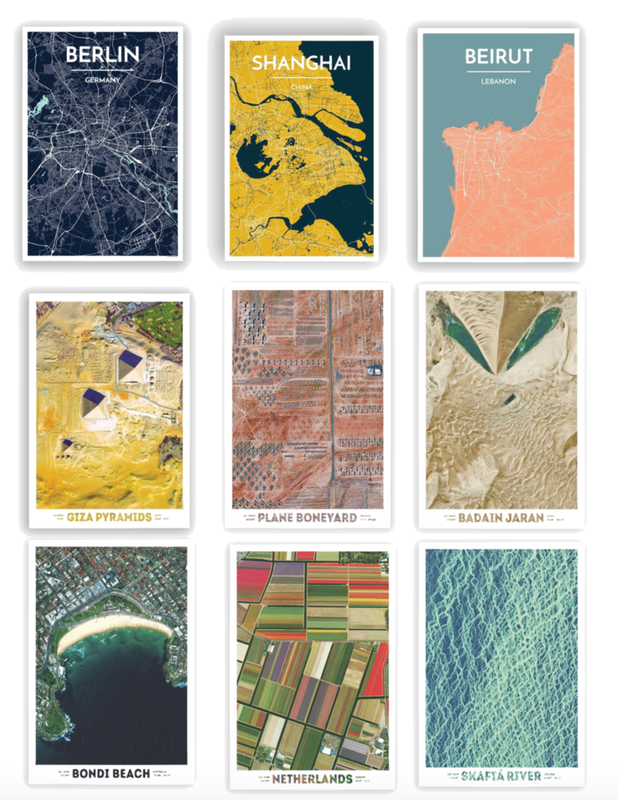 Below are some of the cool maps and satellite prints they offer! So beautiful! I love the wood nightstands we used to have here but i saw these white nightstands from Target's new line Project 62 and had to get them! I love that the brass pull ties into the light fixture and closet knobs! I still need some sort of simple headboard. I want something different, like two large flat pillows or a cool slice of wood grain. I'm not in a rush. I'll know it when i see it! I found the ladder at a vintage store and i think it adds a cozy feel and compliments the art perfectly! The room is bigger, more simple and ready for the baby! I hope you liked this mini makeover and thanks for reading!